I have friends and family members (you know who you are!) who cruise airline reservation sites for deals and have plans made months in advance for getaways to celebrate special occasions. Dave and I are pretty much at the opposite end of that spectrum, waiting until the last minute to make a decision and often ending up staying home, though we usually manage to have a good time regardless. River traffic view from the balcony. Our anniversary this year was no different in terms of advance planning, but we were determined to take the bull by the horns and get out of town for at least one night. 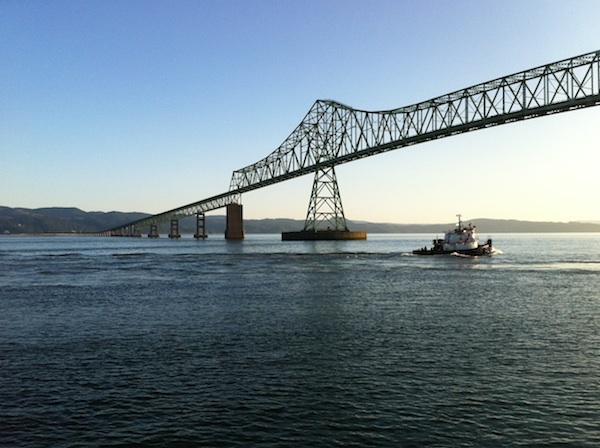 A favorite place of ours is Astoria, a historic port at the confluence of the Columbia River and the Pacific Ocean that's experiencing a renaissance with breweries, restaurants and retail flocking to its downtown core. 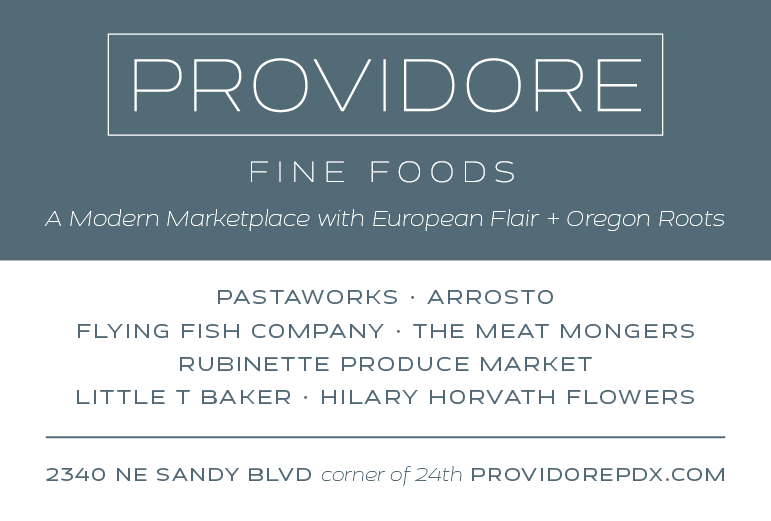 Just inside of two hours' drive from Portland, Astoria is perfect for a day trip or quick overnight. 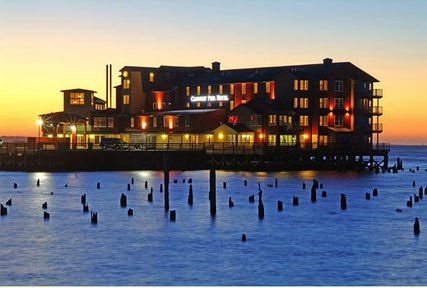 On a previous trip we'd stayed at the Cannery Pier Hotel (top photo), and decided to return there to enjoy one of the rooms that sit right on (actually over) the river. With a balcony featuring a front row seat to the river traffic plowing by under the Astoria-Megler Bridge, it provided a romantic moment for a glass of champagne before we headed downtown for dinner. View from Clemente's dining room. Clemente's had just opened downtown when we first went there, then in 2015 relocated to a dockside location on the town's Riverwalk promenade. 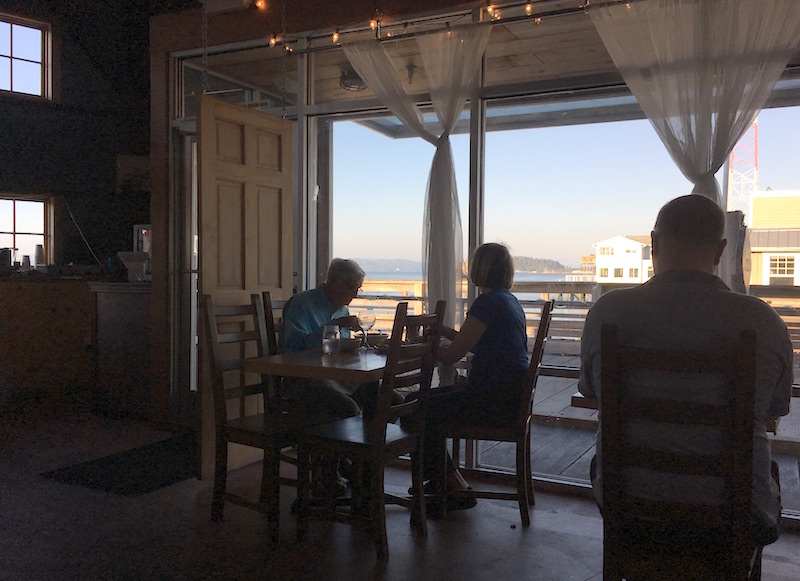 The new location, now calling itself a "café and public house," is more casual and relaxed, a better fit with the restaurant's reasonably priced menu showcasing fresh local seafood and produce, and the setting with its view out over the river is wonderful. 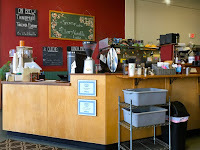 Another new discovery, which Dave ferreted out the next morning, was 3 Cups Coffee House, handily located just a short stroll across the main road from our hotel and featuring coffee from local Columbia River Coffee Roaster. 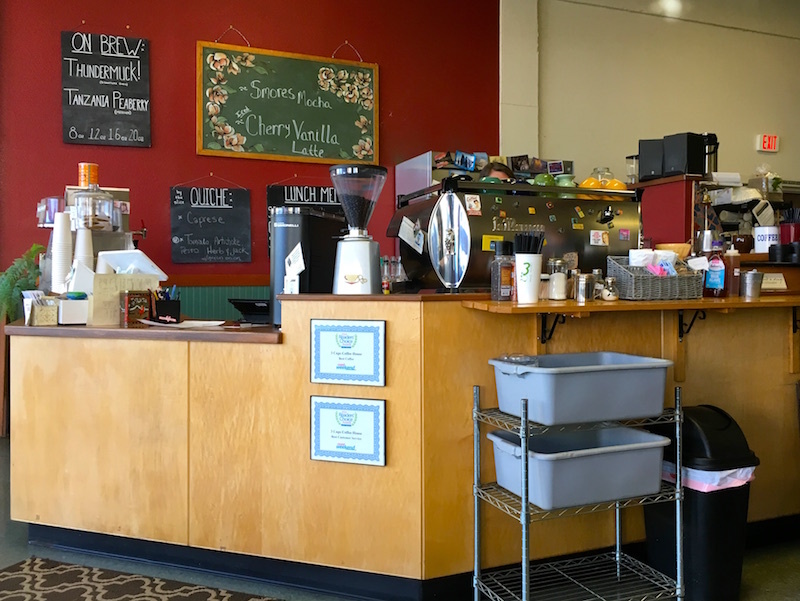 A sweet, casual throwback to coffee houses of old, the brews are solid, the food hearty and simple and the service fast but friendly…definitely worth a stop any time of day. A quick drive down Highway 101 got us to the beach, where we could take a walk in the surf for an hour or so before hitting the road for the drive home, feeling pretty smug that we were able to get ourselves out of town to celebrate. Who knows, with this success in our pocket we might start planning for next year! Read more suggestions about what to do in Astoria! Cannery pier is the best worth the splurge. Enjoy the complimentary car service into town!!!!!! I mentioned it an earlier post, but they have two gorgeously restored, mid-20th Century sedans to whisk you to your destinations. Thanks for the reminder, Pat!